Simply sprinkle the deodorizer over your cat's litter. There's nothing worse than walking into your home and knowing a cat lives there. You know your fuzzy pal has to go potty somewhere, you just don't want to smell it. Litter box deodorizers can be a blessing in disguise, but be careful: finicky kitties might not like the scent. Cat litter deodorizers work by neutralizing odors on contact and are activated by moisture. Many varieties are scented to deliver a pleasant aroma every time your kitty eliminates in the box. Litter box deodorizers come in powder and spray form. 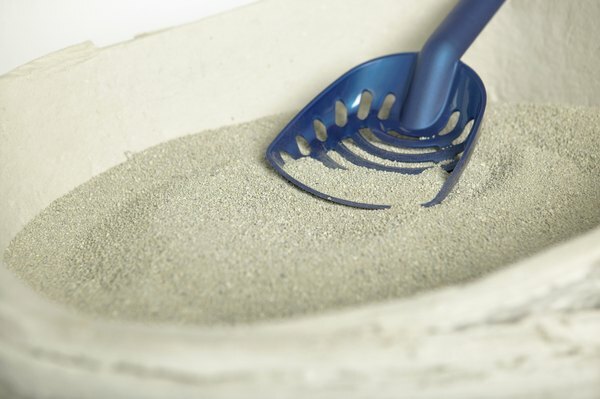 If you use the powder, sprinkle a small amount on the bottom of the litter box, pour in the litter and then add a little on top. Sprays are meant to be used only on top of the litter. Each time your furry family member uses the litter box, add a touch more litter box deodorizer, for optimal odor coverage. While kitty litter deodorizers can be helpful at preventing and eliminating unpleasant litter box smells, your purring pal may not be a fan. Some kitties are sensitive to strong scents and may stray away from using a box that has a powerful floral aroma. Additionally, powdered litter deodorizers make litter even more dusty and your cat will stir up a small dust cloud every time she digs in the litter. If you're sensitive to dust, you may wind up sneezing each time you enter the same room as the litter box. Don't despair if your furry buddy doesn't like the smell of scented litter box deodorizers—other alternatives are available. Use plain baking soda instead of a strong-scented commercialized deodorizer. Baking soda is the main ingredient in many litter deodorizers and helps neutralize odor all on its own, without masking smells with a flowery scent. Several types of litter box liners have built-in odor destroyers or come lightly scented. If your finicky feline doesn't like the strong aroma of litter deodorizers or if the dust bothers you, opting for a different type of liner may be helpful. An unpleasant odor streaming from your cat's litter might stem from a dirty box. Even if you scoop out the litter daily and frequently change it out, if you don't clean the box itself the smell won't go away and deodorizers won't work. Clean the box thoroughly before you add fresh litter, even if you always use liners. Use a mild detergent and warm water to clean the surfaces. Avoid products containing ammonia or citrus oils, which can be toxic and tend to repel cats.